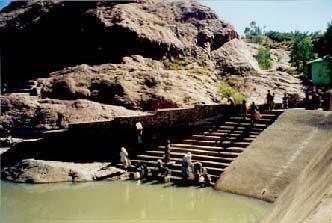 The northern city of Mekelle is one of the most pleasant places to visit in Ethiopia. The people are nice, the streets are wide and good for walking. As a foreigner, one of the most pleasant things about visiting Mekelle is the lack of hassle from locals - there are no crowds following you, no calling out of ‘you, you’ or ‘money, money’. People very pleasantly leave you alone. 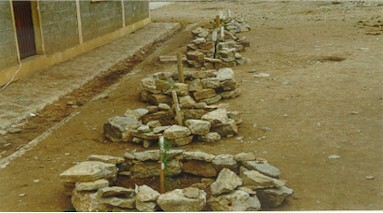 Within 80 kilometers of Mekelle there are reputed to be over 120 rock hewn churches, which makes Mekelle a stop off point or central resting place for visitors. 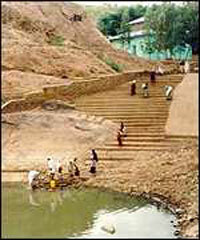 From here day trips to the churches around Wukro or Geralta are easily arranged. The artistic tower spiralling more than 100 feet above the ground, mounted by a large ball, is visible through much of Mekelle. This is the centrepiece of the large war memorial. Entranceways to the memorial are surprisingly stark, but the memorial itself is wonderfully new and engrossing. As you enter the central portion on top of the pink cut stone, the memorial stretches on both sides from the central tower. On each side are larger than life figures, representing the victims and victors of the war. Appropriately black and stick like, the figures include mothers and children trekking out from the famine, several of them not making it. With them are the hardy Tigrayan fighters, machine guns over their backs and trusty donkeys in tow. These peasant fighters overcame the Soviet backed might of the Derg military regime. Appropriately enough, one of the tanks left over from the war lies just beside the monument, and is a somewhat dubious playground for children. My children showed no hesitation in crawling all over and into the tank, with the unbounded curiosity about war items which affects many of us! Massive lights flood the monument at night, an eerie reminder of the recent war. Mekelle was only captured from the Derg in 1989, yet the monument is the only visible reminder of the devastation of the time. The monument is a short walk from the hilltop Castle hotel. To the west of the monument you can see the recently constructed buildings of the attractive Mekelle University, appropriately dedicated to dryland agriculture. Around the castle is the only place in Mekelle where I’ve confronted officious and difficult behaviour from the military and guards. Considering that Mekelle was near the front line in the war with Eritrea, it was in fact a remarkably relaxed place. The exception is the entrance to the castle, which always seems to have some confused and confusing military types who make it difficult to enter and love to boss you around. If you brave the roadblock, however, the visit is worth it. The Castle itself is the major attraction, a high multi-turreted classic castle. 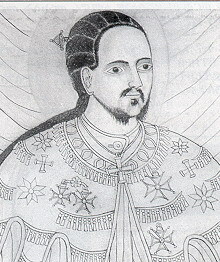 Emperor Yohannes moved back to his home area of Mekelle after spending the initial part of his reign in Debre Tabor, the capital of his predecessor, Emperor Tewodros. This was a period of turmoil in Ethiopia, Tewodros had reunited the country after almost 100 years of warlords, but he failed to maintain his paramountcy and finally killed himself in 1868 to avoid capture by an invading British force. Two years later Yohannes the ruler of Tigray came to power, benefiting from the arms given to him by the departing British, and using his military and diplomatic skills to bring a degree of peace to Ethiopia. After a few years in Debre Tabor, where the remains of his earlier castle can still be seen, Johannes moved to his large new castle in Mekelle, where he ruled until his death in battle with the Mahdists of Sudan in 1881. 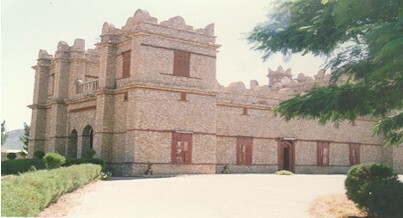 Unlike the Debre Tabor castle, which is a ruin, the Mekelle castle is well preserved and eminently visible. The last time I was there it was under renovation, with promises of new displays on its reopening. Previously the interior was charming but amateurish, with a hodge podge collection of military hardware, royal robes, household effects and photographs all dustily thrown together. It was fun to rummage through it, but not very edifying, even with the helpful but hopeless guide. You could go upstairs by a narrow and somewhat rickety set of stairs, where you could observe the royal bedrooms with some furniture still around. The best part was coming out on to the roof, where you could poke your head through the turrets and observe a nice view over the rooftops of Mekelle. The grounds are also nice and quite well kept, with lovely trees and lawns and flowers. Some machine guns, probably 1930’s Italian era, guard the front entranceway. 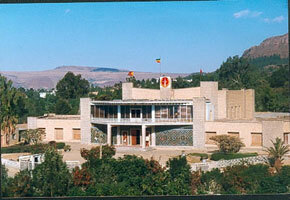 An unusual stop, but one that I don’t regret, is the school which was bombed by the Eritreans at the outset of the war. The war broke out in May, 1998, and the school was bombed on June 5th. I remember the incident clearly from when I heard about it in Addis Ababa. Most of us were still gripped by the shock of the unexpected attack from Eritrea, and curious about how Ethiopia would react. The seizure of a few hundred kilometers of farmland was certainly serious, especially for the families who lived there and had to flee. But the real impact of the war was burned into my memory, and I think that of most Ethiopians, by the images of the children killed at Ayder School. The school sits in an ordinary poor residential district of Mekelle, across from a beautiful new hospital that has been built, reputedly, with the assistance of the all pervasive Sheikh Mohammed Al Amoudi. A clumsy fence surrounds the school, and the gate is marked by a simple sign. Inside the grounds, the school has a look of normality, barren grounds with a grouping of tin roofed classrooms. It is still an active school, a mere bombing couldn’t close a precious educational institution here. As you get closer to the buildings, the normality wears off. You can see the holes in the walls of the classrooms, where the shrapnel from the cluster bombs dug through the cement. One of the long classrooms has a huge hole in the roof, and others have chunks gouged out next to their windows. All this damage has been left as it is, a mute testimony to the destruction of June the 5th. Inside the classroom with the hole in the roof is a museum to the killings. The desks of the students are still in the room, many of them with holes from pieces of shrapnel. Three students died in this classroom - the surprise is that more didn’t. Along the wall are tables where the detritus of the attack is displayed, cardboard casing of the cluster bombs, anti-personnel canisters, metal shell casings. More riveting are the posters and photos that show the victims. Eleven children died in the attack, along with a teacher and a woman with a baby on her back. Their blood spattered bodies are shown in image after image. Now at the school a small shrine and a line of trees has been planted to remember each of the victims. The TV footage of the aftermath of the attack was shown again and again in Ethiopia. Rescuers carried the limp bodies of the victims across the field to cars, tears streaming down their faces. Dozens were injured in the attack. Perhaps the most horrifying thing was that the plane that attacked circled around and came back, attacking again the people who had rushed to aid the victims of the first attack. This attack galvanized Ethiopia in my opinion. The country arose from the shock of the initial invasion into a steely and unified resolve, which eventually resulted in the defeat of Eritrea. I’m no fan of warfare, and the major feeling I have about the war is that it was tragic, but I understand the reaction of Ethiopia. For me the visit was shockingly moving and emotional, more than I had expected. I suspect the school will remain the major reminder of the bloody war with Eritrea. Perhaps in anticipation of a tourist boom after Mekelle emerged from the devastation of the war against the previous Derg government, there have been three very fine hotels built in the city. These were started before the war with Eritrea broke out, and no doubt they have suffered from the lack of visitors due to the latest war. The hotels were quite empty when I visited, apart from the occasional group of rough looking men with Bulgarian or Ukrainian accents. I didn’t ask them what they did! The nicest of the hotels in my humble opinion is the Axum. Predictably their designs and motifs are Axumite, starting with the multi-storey Axumite pillar design on their central wing. Inside windows and archways also attractively imitate the pillar designs. The foyer area is wide and spacious, with a wonderful lounge area using locally designed furniture and art. Even the restaurant is nice in this hotel! The service is good! The staff are friendly! The rooms are comfortable, tidy and well maintained! There is satellite TV in the rooms! By local standards these are all tremendous endorsements! And the room rates are quite reasonable! 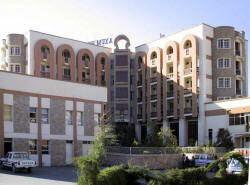 Apart from the Axum Hotel, there are several other nice places - the Hawzien Hotel in particular. Although the Castle Hotel lacks some of the comforts of the Axum, it compensates with its historic resonance. This is an old castle, with turrets and towers. Predictably, the rooms are not that great, and the interior is old. The best room to stay in is the one in the castle turret. It is a government hotel, so the rates are high for foreigners. The restaurant is unremarkable, but there is a nice national food restaurant in a tukul at the end of the walkway. The real advantage of the castle is the view, which you can take advantage of on the balcony having coffee or beer, you don’t have to stay there. From here you can see Mekelle spread out at your feet, with new government buildings mingling with the castle of Emperor Johannes, and the large monument to the victims of the war against the Derg government.